Go and discover science for yourself as you investigate Edison’s Lab. Find out about the legends of science, sing along to some crazy science songs and even turn your own home into a science lab! 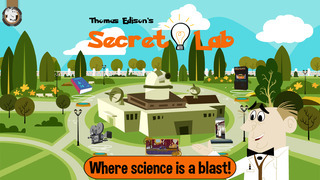 The Secret Lab is an app based on the new American TV children’s cartoon show of the same name, which is currently available on Netflix and DVD. Along with Thomas Edison and his robot assistant, Von Bolt, there are five kids who guide you around the different rooms of Edison’s home. In each room there is a science-themed activity that will introduce children to a wide range of topics in science. In the library you can uncover facts about the history behind some of the world’s most famous scientists. The scientist’s profile includes a short biography, pictures of their inventions, fun facts and a personal inspirational quote. Initially in this room it seems to be quite empty but by searching round you’ll soon discover the hidden scientists. 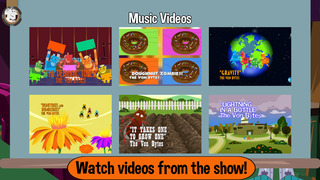 On offer in the movie theatre are short video clips from the TV show, some of which are educational music videos. These songs are quite humorous and feature ‘The Von Bytes’ a band of colourful robots who sing about things like gravity, the periodic table and bumblebees. The episode clips give you a taster of what the full show is about as Thomas Edison encourages the kids to go and discover science for themselves. If you want to read up on each of the members of The Secret Lab gang they are all introduced in the ‘HoloCentre’ room. 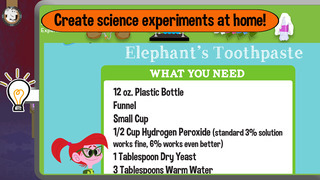 The secret lab is where you can learn about simple yet impressive experiments that can be done at home or in school. The four experiments are explained with a list of things you need, a set of instructions to follow and the all-important reason of how it works. There is a lot of fun to be had in the Arcade room where three basic games can be played. 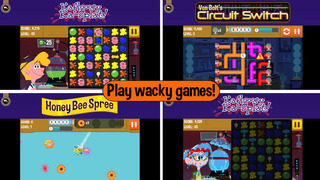 They are loosely based on chemistry (‘Kaflooey Ka-Splat!’, a matching chemicals game), biology (‘Honey Bee-Spree’, a pollination game) and physics (‘Circuit Switch’, completing circuits game). Each game is easy to pick up and there are two levels of difficulty to keep you entertained. As with the cartoon TV show this app is aimed at primary school aged children who are beginning to connect with the world around them using a scientific mind. Their interest and curiosity will be fed in many different ways by this app. Significantly, most of what they can learn is found through their own investigating because the app doesn’t follow any set path, it is up to the user to go where they want, when they want. Some of the scientific language can be a bit inconsistent; it is sometimes slightly too complex for the average pre-teen scientist. With this in mind a nice addition to a possible future update would be to include a glossary of scientific terms for each section and this might help those learners who are enthusiastic about knowing more. Together with Thomas Edison, the greatest inventor of all time, the Secret Lab Kids will show you how fun science can be. In fact, it’s a BLAST! Unknown to the world, Thomas Edison had a secret lab where he invented a virtual version of himself and Von Bolt, a nearly-completed robot, to guide and inspire future generations of young scientists. The secret lab, Edison’s virtual ego, and his prototype robot remained hidden until Angie, a 12-year old prodigy, recently cracked the secret coded message that Edison left behind. The young genius and her science club move into the lab and the fun begins. Explore the lab, play games, learn about Thomas Edison and other inventors, meet the Secret Lab Kids, learn about inventions and discoveries, create holograms, and enjoy some great videos. Arcade with 3 wacky games! • Honey Bee Spree - Join the Secret Lab Kids as they help their bee friend pollinate flowers! • Kafloooey Ka-Splat - Crank up the kaloogalator to splat the Secret Lab Kids with Kafloooey! • Von Bolt's Circuit Switch - Connect the circuits to light up the light bulbs in this flip-tastic challenge! 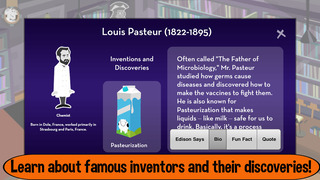 Thomas Edison's Secret Lab app was created through a partnership of Genius Brands International and FatRedCouch. Headquartered in Beverly Hills, California, Genius Brands International (http://www.gnusbrands.com) is a publicly traded global brand management company that creates and licenses multimedia content for toddlers to tweens. Led by award-winning creators and producers CEO Andy Heyward and President Amy Moynihan Heyward, GBI creates “content with a purpose,” meaning content that is as entertaining as it is enriching. GBI’s growing library of content includes the award-winning Baby Genius, Warren Buffett's Secret Millionaires Club, Thomas Edison's Secret Lab and Stan Lee’s Mighty 7, the first project from Stan Lee Comics, a joint venture with legendary Stan Lee’s POW! Entertainment. Fat Red Couch (http://www.fatredcouch.com) uniquely blends brands and technologies to create innovative entertainment, publishing and educational experiences using digital platforms and durable goods – a process called Digital+Durable™ – which includes lines such as the Magic Toy Maker and U of Chew. Some of their other immersive interactive titles include A New Home for Charlie the Chocolate Chihuahua, and Puff, The Magic Dragon’s Playground. FatRedCouch is a proud member of Know What's Inside, a collaborative group of family-friendly developers with family-friendly apps. Do you have questions, suggestions, or concerns? Please email us at support @FatRedCouch.com and we will be happy to help!